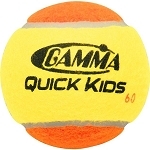 QuickStart tennis balls are perfect for kids learning tennis. The two-color construction helps with learning and practicing spin, and the balls move more slowly than regular tennis balls so they're easier for children to play with. 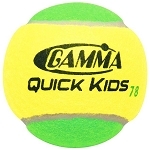 We have three types of QuickStart Quick Kids tennis balls that move at different speeds. The 36 ball moves 75% slower than a standard tennis ball, the 60 ball moves 50% slower than a standard tennis ball, and the 78 ball moves 25% slower than a standard tennis ball. As kids get more practice at tennis, you can move them up to faster balls. All our QuickStart tennis balls are perfect for 10-and-under tennis. If you have any questions, you're welcome to contact us at Tennis Court Supply for more information. Don't forget to check out the rest of our catalog for the other kids' tennis supplies you need.